Squidoo Exploit - "Samy is my hero again"
Here is what happened in February 2007, re-edited for brevity and readability. I was new to Squidoo and had just created my account and my first lens. A lens is how Squidoo calls the pages that users make, in their FAQ they describe it like this: "It's an easy-to-build, single web page that can point to blogs, favorite links, RSS feeds, Flickr photos, Google maps, eBay auctions, CafePress designs, Amazon books or music, and more." My lens was an experiment to evaluate Squidoo for a project that I was working on, I certainly wasn't expecting to find a gaping security hole! After creating my account I had received a mail from Squidoo, in order to verify my e-mail and activate my account. That all worked (and I wasn't paying attention very much to this process as it is so common). Later I had an evening in town with some friends and after returning home, I wanted to make a quick update to my new lens before going to bed. But when I tried to log in, I was denied access and got the message that my account was still not confirmed. Weird, I was sure I had already confirmed my account. But a link allowed me to resend the confirmation e-mail. So I did that. What they sent me was this link: http://www.squidoo.com/member/confirmation/ottodv I clicked on it and was logged in. But then I started to think, how come that I am logged in? I did type in my userid and password before having them send this mail so maybe that in combination with following the confirmation link is what did it? But I did not type it in again after following that link! That got me thinking. As you can see in the link, the last part (ottodv) is my userid. So I decided to do a simple check. 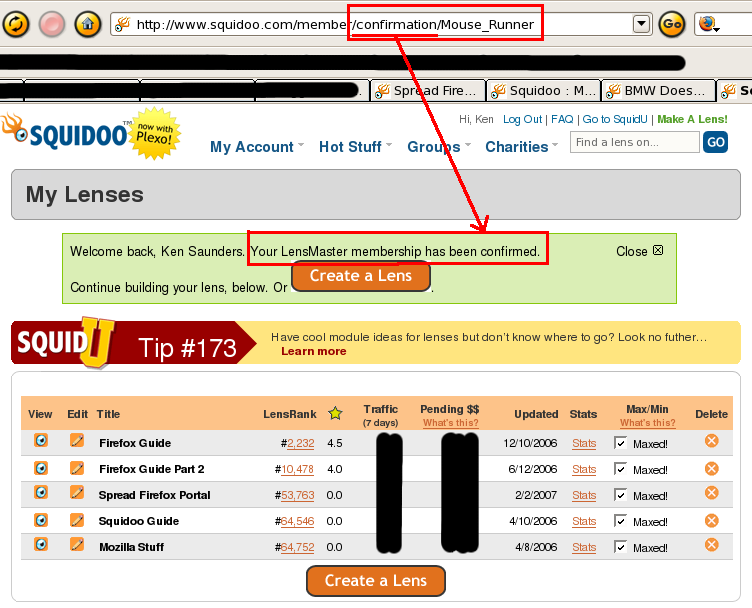 From the Squidoo homepage I randomly chose a lens and noted the userid of that lensmaster. Then I replaced my userid with that of the other lensmaster in the confirmation link... Surprise! Without supplying any password I was logged in as the other lensmaster and I could edit his lenses (at least I could enter edit mode). Then of course, came the dilemma. I am not going to vandalize someone else's work, but still want to check how far I can actually go. Thankfully I then thought of my friend Ken, he was the one who had suggested Squidoo to me and of course he had a lens. I know him well I and knew he wouldn't mind if I made a small edit to his lens. So I looked up his userid and using that in my URL I became Ken on Squidoo. I edited one of his lenses by adding three exclamation marks to his lens. Then I mailed him that I had "hacked" his lens, he replied that he was very impressed. Ok proof enough. I had to do something now to get the problem fixed. This method was so easy and could be discovered by anyone else at any moment, presuming other new users would receive these "confirmation" e-mails as well. It was therefore vital that it got fixed quickly. I initially reported the problem via the "bugs & feedback" feature on the Squidoo website, but the next day it was not yet picked up. So I decided to make it public and hopefully attract some attention from Squidoo staff or someone who could get the attention of Squidoo staff. However I had to prove my claim in such a way as not to risk revealing how I did it (even trying to avoid anything that could be used as a clue). Edit your lens, and add the test "Hack me Samy" anywhere in the top portion of your page. This proves to me that you gave me permission to edit your lens and that it actually belongs to you. (unless of course you hacked it). Add the URL of your lens to the Digg story, the Squidu forum or mail it to me. I will add the text "Samy is my hero again" after that line. Please leave the change so I can add the URL to the list below as proof. Firefox Extension Reviews Lens - thanks Marco! Should Squidoo have responded faster to their user feedback? Probably, but it was on a Friday night / Saturday morning and I don't think Squidoo is such a big operation (yet) that all incoming messages are processed on a daily basis in the weekend. Without my public announcement it might not even have been read until Monday morning... who knows? Should I have waited until Monday before going public and potentially saved Squidoo some embarrassment, if they actually read the message on Monday? It was my judgement that this exploit could be discovered by others pretty quickly, in the wrong hands this exploit could have been disastrous and caused much more embarrassment to Squidoo. Did Squidoo make an unusually serious mistake in their software? Software can be very complex and mistakes happen, actually there is no software without bugs or errors. Squidoo is neither the first nor will it be the last webservice to suffer such a mistake. Microsoft's hotmail suffered from a similar exploit several years ago. If Gil or Squidoo ever care to post their side of the story I will link to it here. Other services might have banned me for even trying an exploit, but Squidoo didn't, instead I was thanked for reporting it. Some people, find it interesting to investigate such issues. Encouraging people to report problems is an important aspect of websecurity, banning them is counterproductive. Is it safe to use Squido now? Yes. Try it, it's actually a pretty cool service and their heart is in the right place as you will soon find out. p.s. "Samy is my hero again" is a tribute to Samy's MySpace exploit. He did cross the line by altering other people's stuff.